In the fifth pAsuram, parAnguSa nAyaki tells her friend “Even if emperumAn is not having noble qualities as I said and is having many faults like being cruel, my heart will not know anyone other than him”. Fifth pAsuram. parAnguSa nAyaki tells her friend “Even if you say ‘he has no good qualities, he is cruel’, there is no use for such statements, and even if you highlight his defects to withdraw me from him, it will only help in me pursuing him”. thudi koL idai madath thOzhi! annai en seyyumE? ellE – ellE (wonder struck thinking about having these qualities – since emperumAn pursues first, since he eliminates our attachment in external matters, since he has great attachment, since he places us at his divine feet exclusively, since he is an amazing entity who is having an inconceivable form after having helped us) – what amazing qualities does he have! Though emperumAn is cruel, evil and is having great supremacy in accepting the whole world for himself, without leaving anything for the others and is being deceptive in having it for himself, and though he is amazing in captivating us by his inconceivable beauty, my heart will remain considering “he is the only refuge”; what amazing qualities does he have! Oh friend who is having a slender waist and having humility! what will my mother do? ellE indicates her being wonder-struck as well as calling out to her friend. mAl indicates greatness and love. kadiyan … – Even to highlight his faults, only I am qualified to do so; you have only seen him from distance unlike I who have fully understood him by being together with him; this being the case, parAnguSa nAyaki tells “just listen to me”. kadiyan – Harsh. Very selfish. If we wants to get something done, he will disregard the other person’s interest and pursue forcefully. kodiyan – While he pursues and enjoys with us, he cannot guarantee that “I will not leave you”. What can he not do when he thinks about separation while being together? Is there anything impossible for him to do when he thinks about something else while being together as said in periya thirumozhi 9.3.3 “pEdhai ninnaip piriyEn ini enRu aganRAn” (saying “Oh ignorant girl! I won’t separate from you” and separated). nediya mAl – mAl – greatness. By “nedumai”, the abundance of such greatness is indicated. By this, it indicates that while emperumAn is right inside the reach of our hands, he is also immeasurable. Though knowing well that “he is planning to leave”, his nature is as explained in thiruviruththam 8 “sENkunRam senRu poruL padaippAn kaRRa thiNNanavu” (an act of going to the mountain with high peaks to earn new wealth). Even when he himself pursues and unites, if he thinks about leaving, we would be unable to question him strongly “why are you planning to leave?”. ulagam koNda adiyan – If he wishes to take over some one else’s belongings, he would do so without leaving anything for them. He will push them into pAthALam (lower planetary layer) [as in the case of mahAbali]. He bestows them the assembly of pAthALam. He is the one who is having the divine feet [adi explained as feet] to capture everything which he desires to grab from someone. aRivaru mEni – He is having a form which makes one wonder when approached, “is he thinking to give us all his wealth or is he thinking to capture all our wealth?”. He captures oneself and the belongings by approaching and saying “my self and all my belongings are at your disposal”. First, he made himself and his belongings to be at her disposal and then captured her. mAyaththan – While she has lost her heart thinking about his words “I and my belongings are yours”, he would disappear in thin air – he is having such amazing capability. Agilum – I am capable of highlighting many of his faults which cannot be revealed by you or demoniac persons like SisupAla et al, if I plan on giving him up. kodiya en nenjam – My heart which is of different nature from the worldly hearts and is of different species. For worldly people, good qualities lead them to pursue some one and bad qualities lead them to give up some one; but here, my heart is such that, his bad qualities are the reason for its attraction towards him. avan enRE kidakkum – For this piLLAn explains “even these bad qualities belong to [my dear] emperumAn [So, I will enjoy them]”; [that is] if he is cruel, I want to see his cruely right now; if he is evil, I want to see his evil nature right now; if he is difficult to attain, I want to see that difficulty right now; if he is robber of all my belongings, I want to see him rob me and be robbed of everything; if he is difficult to be conceived, I want to understand the difficulty of conceiving him. avan enRE kidakkum – Another explanation – even if my heart becomes attached to mAyAvAdha philosophy, it is alright. That is – ignoring the viSEshaNams (qualities) and just focussing on the viSEshyam (brahmam, the supreme entity) is sufficient. From this, it is understood that – our relationship with him is not based on his qualities, but it is based on the existence of both the entities [paramAthmA and jIvAthmA]. ellE – How amazing! Alternative explanation – The friend started leaving parAnguSa nAyaki saying “You have not listened to my words of trying to withdraw you. You be the way you want to be”; it can be said that parAnguSa nAyaki holds her friend’s hand, stopping her from leaving and calling her out. thudi koL idai madath thOzhi – She says “thudi koL idai madath thOzhi“. Oh friend who is having a slender waist and who is having noble quality of humility! You should speak matching your form, quality and our relationship. Her friend says “I am not speaking without knowing [your heart] and useless words. I am speaking like this fearing your mother”. annai en seyyumE – Since I did not even obey your words, will I obey my mother’s words? Beyond the simple meaning, the following needs to be thought through. 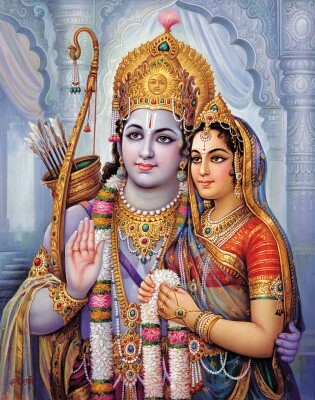 anasUyA told sIthAp pirAtti “For women, their husbands are their Gods” and hearing this, sIthA out of shyness, put her head down; she then said “the people of this world think that I have SrI rAma very dear to me due to his auspicious qualities; while by divine arrangement, he has auspicious qualities, I will remain faithful for him even if he is devoid of auspicious qualities and a beautiful form; but I can only prove this if I can separate his auspicious qualities from him [which is not possible]”. These are the words of the one who truly understands the relationship with bhagavAn. In periya thirumozhi 11.8.7, it is said “vEmbin puzhu vEmbanRi uNNAdhu” (a worm originated in neem, will not eat anything other than that neem) [to indicate that he is always dependent on emperumAn only]. If this is expressed in the matters of emperumAn who is filled with auspicious qualities, should it not have been said as “karumbin puzhu karumbanRi uNNAdhu” (a worm originated in sugarcane, will not eat anything other than sugarcane)? The neem is highlighted here, to emphasise “even if he does not have any good qualities, I will not give him up”; naturally in emperumAn who is filled with all auspicious qualities, this will be true. If we look at my nature, I cannot leave you and even if you don’t behave like yourself, I cannot leave you. This entry was posted in thiruvAimozhi, thiruvAimozhi 5th centum on June 18, 2017 by Sarathy Thothathri.